Costa Daurada is an area on the coast of Catalonia, between Cunit and Alcanar. 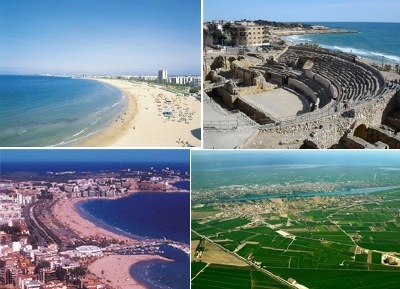 It is entirely included in the province of Tarragona. 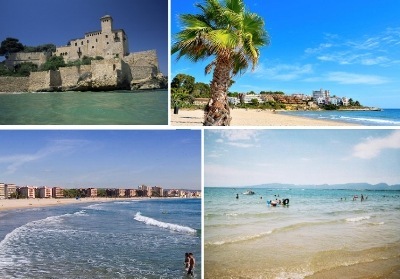 Costa Daurada, literally, the Golden Coast, takes its name from the colour of its sand when the sun is shining. At such times, its beaches are reminiscent of gold. Of course, gold is hardly the only colour to be found in the land. The region's inland areas are home to the full spectrum of greens and browns, with grasses, leaves and trees, especially pines. In contrast, the coastal regions are dominated by the spectacular blue of the sea, which offers a pleasant contrast with the bright glow of the sand and the orange-tinged light of the setting sun. The Costa Daurada shoreline is comprised of a total of 13 municipalities, which, over a stretch of 92 kilometres, offer some sixty different beaches in all shapes and sizes from the small, secluded coves of Mont-roig del Camp-Miami Platja to the dramatic cliffs of Torredembarra, from the high-iodine waters of El Vendrell-Coma-ruga to the fine sand and clear shallows of Salou. Several Costa Daurada beaches have been awarded the blue flag by the European Foundation for Environmental Education, in addition to other distinctions, such as that earned by Creixell from the same organisation for its wheelchair-accessible beach or the Ecoplayas Award for clean and sustainable beaches and ISO 14001 environmental management system certification earned by the beaches of Calafell. The towns of Calafell, Salou and Cambrils have moreover been officially certified as family tourism destinations by the Catalan government. Costa Daurada also has a network of environmentally valuable protected coastal areas, where visitors will find great bird diversity amidst the wetlands and dunes. These areas are dominated by Mediterranean scrub and dotted with palmettos, the only palm species native to Europe. Costa Daurada's nature reserve network is also equipped with the necessary infrastructure for visitors. The welcome centres at the nature park and other protected areas and a slew of tourist information offices offer visitors all the information and assistance they need to enjoy this striking natural heritage to the full. The offer is rounded out by guides specialised in nature interpretation and several sporting and nature activity companies, making Costa Daurada an exceptional destination for lovers of the great outdoors. Costa Daurada is graced with a quintessentially Mediterranean climate, marked by mild winters and warm summers with little rain. In winter, this is due to the mistral wind, which blows in from the northwest, and the garbí, which blows from the southwest; in summer, the region's low humidity prevents the formation of fog.